Laboratory beakers are containers used in various type of industries by chemists, researchers, and educators to measure, mix, analyze, transport, and heat substances in a variety of laboratory, educational, and life science applications. 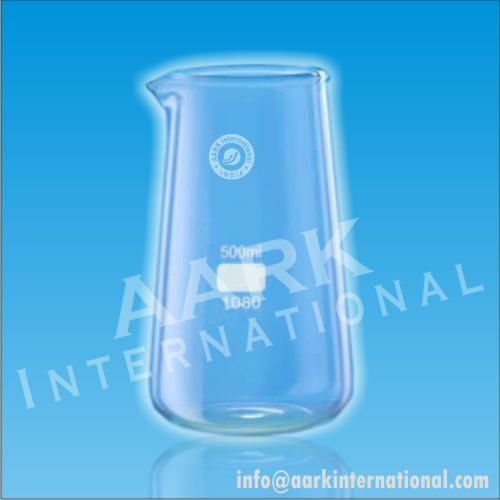 Laboratory beakers are usually made of glass such as borosilicate or plastic materials such as polytetrafluoroethylene (PTFE), polypropylene, or polyethylene. Material types are chosen for their chemical, heat, and corrosion resistance, and for their surface finish, clarity, and non-contaminating abilities. Beaker forms commonly include Griffin (low overall height), Berzelius (a high form), or a conical structure, which is used for liquid crystallization. Beakers, Griffin, Low Form, with spout are made from borosilicate glass. Its uniform wall thickness distribution makes it ideal for heating liquids and it is glass is highly resistant to thermal shock and chemical attack. Beakers, Tall Form, with spout are made from borosilicate glass. Its uniform wall thickness distribution makes it ideal for heating liquids and it is glass is highly resistant to thermal shock and chemical attack. Beakers, Conical, with spout are made from borosilicate glass. Its uniform wall thickness distribution makes it ideal for heating liquids and it is glass is highly resistant to thermal shock and chemical attack.